Are you noticing any track marks around your yard that look like dead grass? It may seem like it’s damage from fertilizer or the tires on your lawn mower, but it’s not likely. Chances are that it’s actually a lawn disease known as Ascochyta leaf blight. This fungus has been targeting many lawns here in Ohio, but we have the tips on how to control and prevent this summer lawn disease! Ascochyta leaf blight is a fungal lawn disease that attacks grasses such as Kentucky bluegrass, tall fescue, and perennial ryegrass. This disease attacks the blades of the grass and makes them appear bleached or brown. It mainly occurs during the summer when your lawn is already vulnerable to being stressed from the heat and weather conditions. Leaf blight comes rather quickly and can spread throughout your lawn easily. 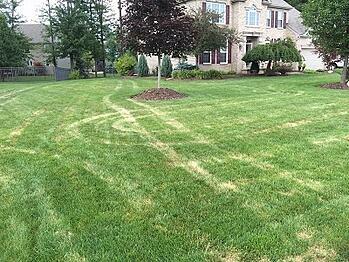 You might first notice it after you mow your lawn and the areas where the tire tracks are. This might happen because the tires will pick up spores of the disease and spread them across your lawn to other spots and it appears most noticeable in the spots that are driven over. Luckily, leaf blight does not attack the crown or roots of the grass so the damage looks worse than it actually is. However, the grass is still damaged and you should take action as soon as you notice the disease. Start by using a fungicide on your lawn. This will halt the fungus from spreading further. When the disease stops spreading, the damaged areas will just grow out over time. Make sure you continue mowing and watering by following the proper techniques for each. Keep your lawn mower blades sharp and don’t mow your lawn too short to prevent further stressing your lawn. Don’t water too often because that will also make your lawn more vulnerable to disease. It’s always better to water deeply, but infrequently. A good way to prevent your lawn from becoming vulnerable to leaf blight and other diseases is to keep it maintained well! Follow those proper methods for mowing and watering, and keep your lawn fertilized. You can also learn about some other summer lawn diseases that you should keep an eye out for here! Having a professional lawn care company can help you handle issues such as lawn disease. If you’re interested in hiring a professional company, check out our Hiring Guide. It has all the tips you need to know when deciding which company is right for you! Download this FREE guide now by just clicking the button below!